This is a spread for Community Central Bank that announced their arrival in the Grosse Pointes. They featured local companies that have benefitted from CCB investments. CCB takes great pride in having local businesses as their customers. They have a quick and easy business loan approval system that doesn’t require the approval of the other banks’ home offices. 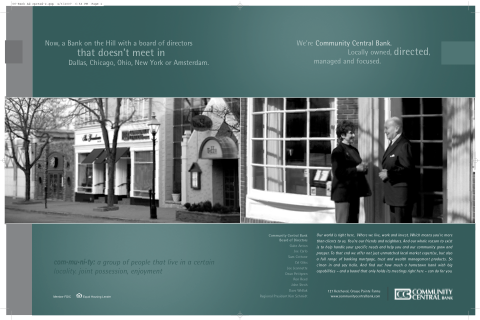 The other banks are located in Europe, Chicago and Dallas, which gives Community an advantage over the others, as they are local.